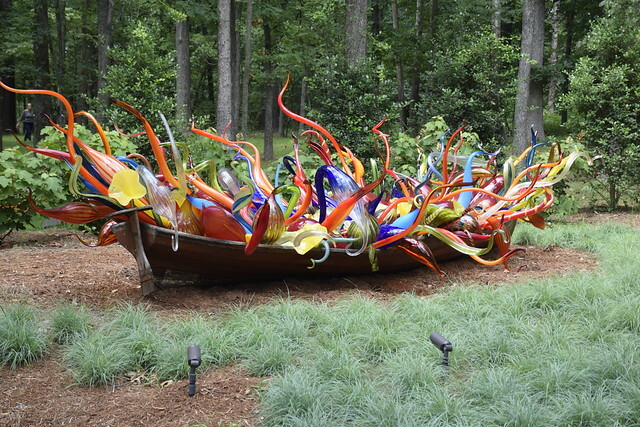 This past Sunday the family loaded up and ventured over into Bentonville, Arkansas to see the Dale Chihuly glass art exhibition hosted by the Crystal Bridges Museum of American Art. 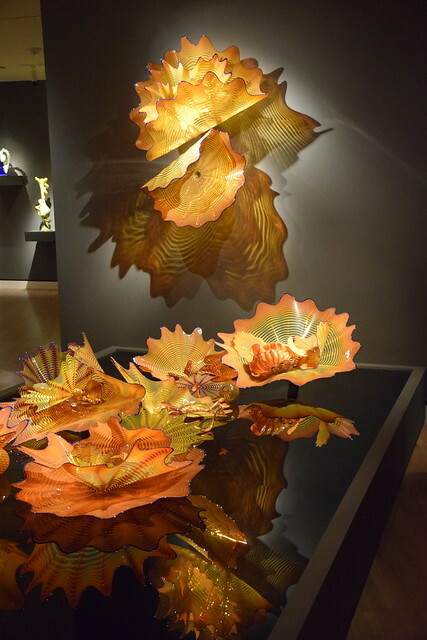 Chihuly’s art is amazing. 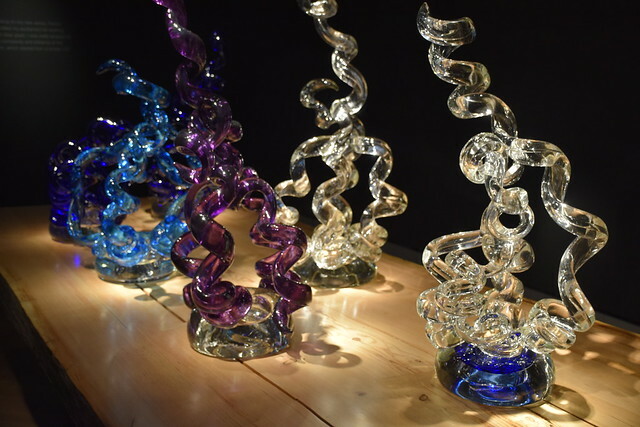 Blown glass with all sorts of colors made into all sorts of shapes. Big pieces, little pieces, everything. As good as the art is, the presentation is also special. The setting, the lighting, everything is perfect. Not only the glass but the shadows and the reflections are part of the installation. All sorts of designs are his hallmark. They had some of his paintings on display along with three videos of him in action. His painting technique fascinated me. This isn’t some guy with a beret dabbing at a canvas. He paints directly from the tubes in big bold strokes. He drips paint from buckets, it is all very physical. They had videos of the glass being blown. Big burly guys struggling with the big pieces trying to get the color and shapes right. This is very muscular art. 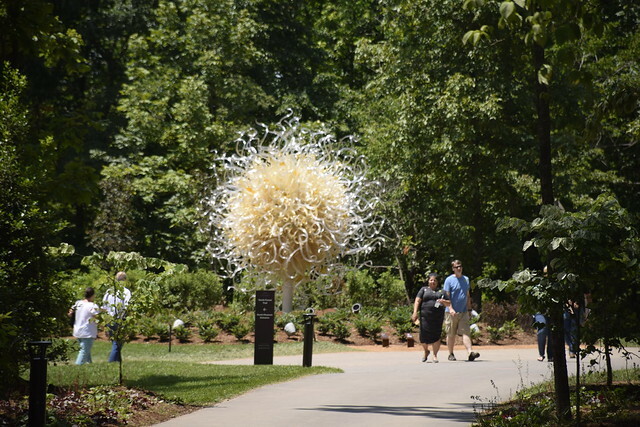 The exhibition has two parts “Chihuly in the Gallery” and “Chihuly in the Forest.” The piece above seemed to hover in mid air and seemed alive as it shimmered in the sun. It reminded me of something from a Stephen King story. This piece contains over a thousand individual pieces. 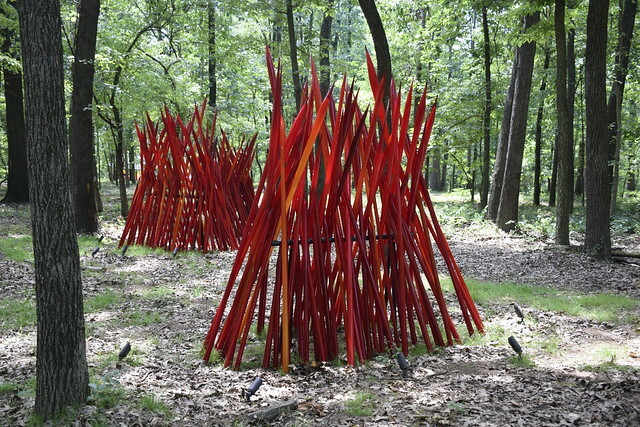 The art seemed a part of the forest, the woods and the glass complimenting each other. Once a week or so they have a nightime exhibit. I think that would be spectacular. 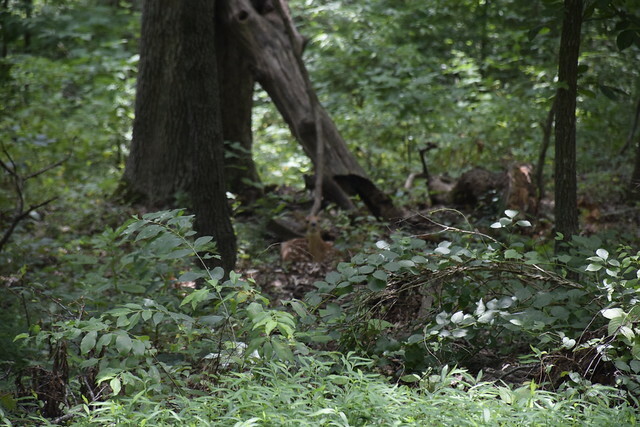 And not far away were two fawns. That is cool. I don’t know where mom was. They were in a safe spot. 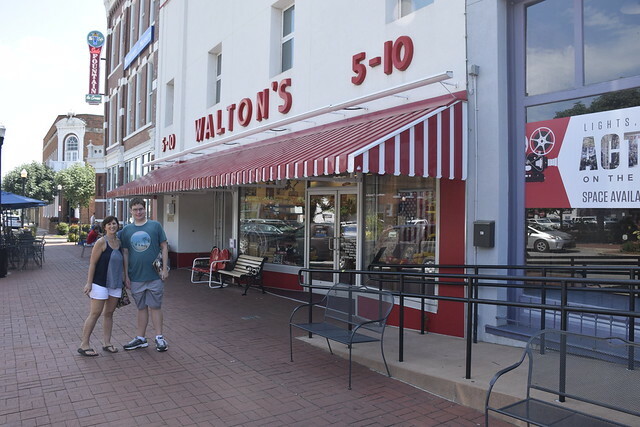 Afterwards we drifted in the town square of Bentonville to eat and came across Sam Walton’s first store and museum. 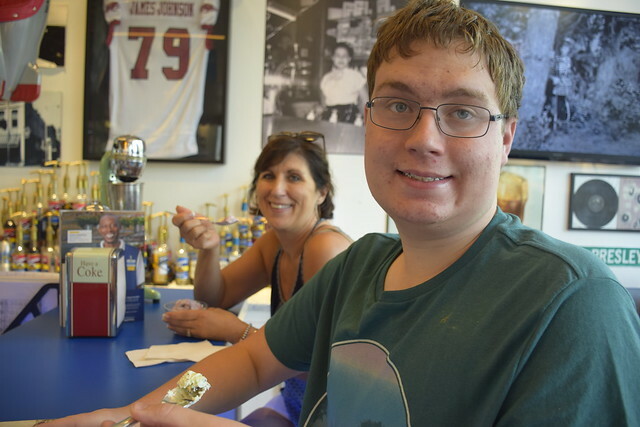 They had an old time soda fountain with ice cream at 99 cents a scoop. Not a bad finish to a great road trip. 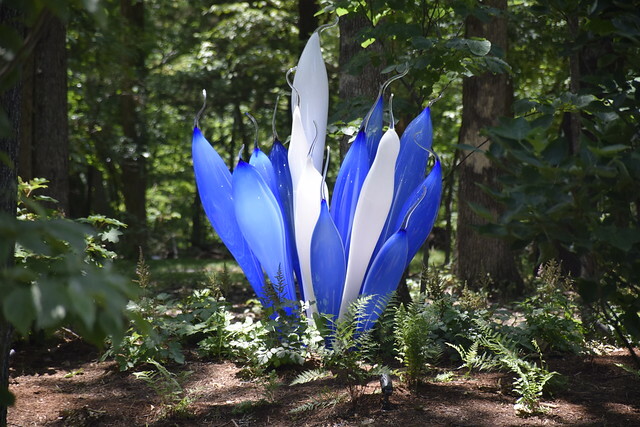 This entry was posted in Our World Tuesday and tagged Arkansas, Art, Bentonville, Crystal Bridges Museum, Dale Chihuly, Glass Art, Museum, Our World Tuesday on July 3, 2017 by Alan Bates. These are incredible photos of breathtaking works of art. If I find a photo of him in a beret I’ll be sure to share it with you (; There was an old soda fountain not too far from here complete with old dude who would make you the perfect ice cream soda. I was very sad to hear they took it down. Great find and wonderful jobs on shooting the glass artwork. That outdoor white floaty piece—insane. That is a real cute photo of your family in the last shot. Gregg is always looking out for an old-time soda fountain when we are on our trips. 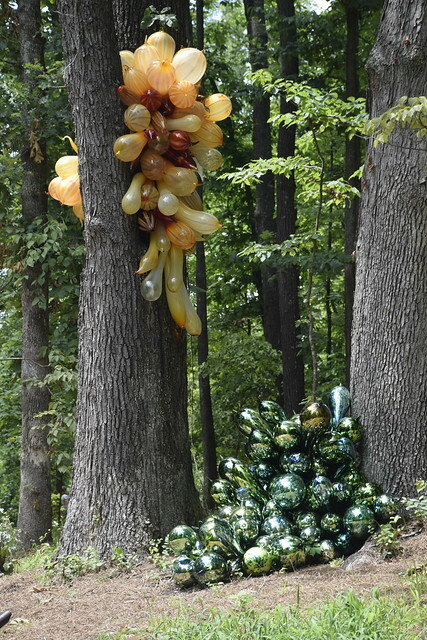 I am a big fan of Dale Chihuly and his glass sculptures. I saw something similar to the one in your last shot in a small park in London a few years ago, except that it was multi colored. I also saw a ceiling design of glass in the Belagio a few years ago, but at that time I didn’t recognize that it was a Chihuly. Fabulous piece! 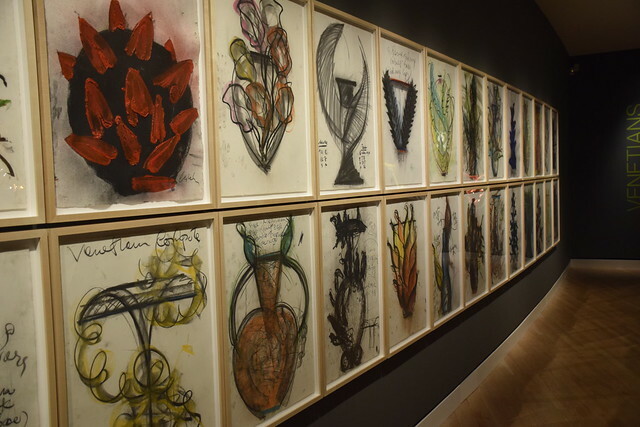 I would have enjoyed this exhibit. I meant to say your sixth shot for the one I saw in London. 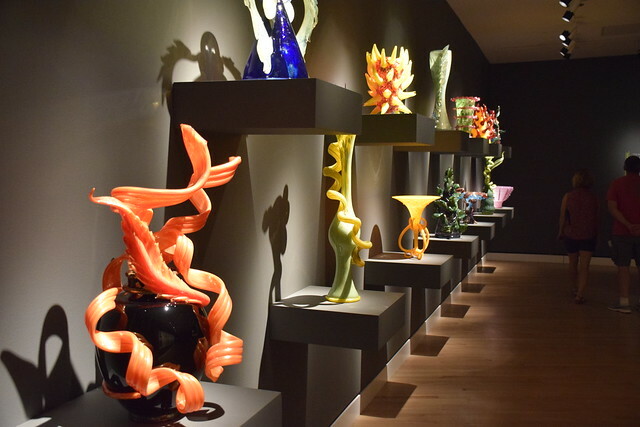 I really admire Chihuly’s glass yet not in the outside settings. Didn’t know he painted too. Does look like a nice family road trip. I just got our new membership cards, so I think we will visit the exhibition next week. The next time you’re on the Bentonville Square have lunch at the Filling Station Cafe. It’s on the same side of the square that the Walton Museum is located. Their burgers are the best. Have blessed week. The glass work is exquisite! 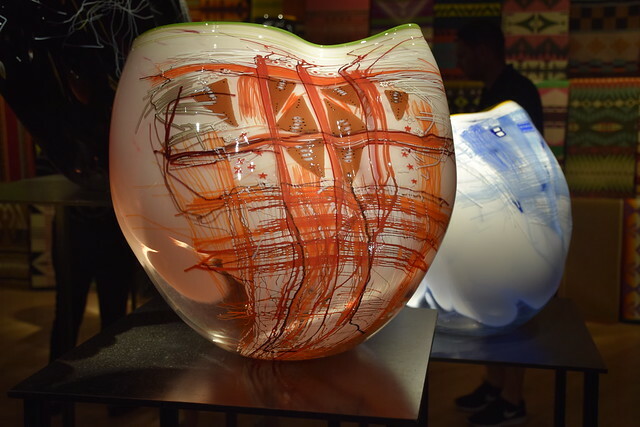 Beautiful — we visited the Chihually museum/workshop in Tacoma WA — and watched some of those burly guys doing their thing — you are so right it is very physical art. And hot. Wow. But amazing results.